Ed Gein was a notorious killer and body snatcher. He killed at least two women and desecrated the graves of many more in three local cemeteries during his lifetime. Additionally, Gein used the bones and skin from the corpses to fashion them into hideous trophies which were later found by the authorities in his house. Edward Theodore Gein was born on 27 August 1906 in La Crosse, Wisconsin, the second child of Augusta Crafter and George P. Gein. His father was a violent alcoholic often struggling to maintain a steady job and his mother, who operated a small family grocery store, was the family breadwinner. She despised her husband, but the marriage somehow persisted, mostly due to the family’s religious beliefs about divorce. Ed was a very shy and isolated child who was often bullied at school. To make things worse, his mother didn’t allow him to make any new friends, which meant that the only friend Gein had during the early years of his life was his brother Henry. She abused the little boys and often said that they would become just like their father. Gein’s father died of a heart attack in 1940, so Henry and Ed started working as local handymen to help with expenses. Henry tried to become more autonomous from his mother’s influence and was concerned with the way she treated his younger brother Ed. However, he died under mysterious circumstances, whilst trying to extinguish a fire near their farm in rural Wisconsin. What was left of the family were only Ed and his abusive mother, who became even more erratic after Henry died. However, two years later, she suffered a stroke and died on 29 December 1945, leaving her only son Ed alone on the farmhouse. Gein sealed off a room in his home as a shrine to his mother and started reading horror novels and anatomy books. He became particularly interested in the medical experiments performed on Jews in the concentration camps during World War II. It didn’t take long before he began prowling cemeteries and exhuming recently buried bodies with the goal to fashion trophies and keepsakes from their bones and skin. Apparently, his trophies weren’t enough to satisfy his appetite, so Gein turned from grave robbing to murder. On 19 November 1957, Bernice Worden was reported missing. The investigation showed that the last person to see Bernice alive was Gein himself. The police found out that he had been in the shop the night before Worden disappeared, so they went to his home to see if Gein knew something concerning her mysterious disappearance. The case was closed once they entered into Gein’s home. Worden’s body with her head cut off had been hung upside down from a meat hook with her internal organs removed. But that was just the beginning. It was a real house of horrors. Deputies were shocked to find out that Gein preserved many body parts, including bones, noses, skulls, skin, etc. and fashioned them into furniture. He was found to be mentally incompetent, and therefore unfit to stand trial, so he was sent to the Central State Hospital for the Criminally Insane and later transferred to the Mendota State Hospital in Wisconsin. It took ten years before Gein was declared fit to stand trial and he was found guilty, but since he was declared previously to be legally insane he was sent back to a mental facility. 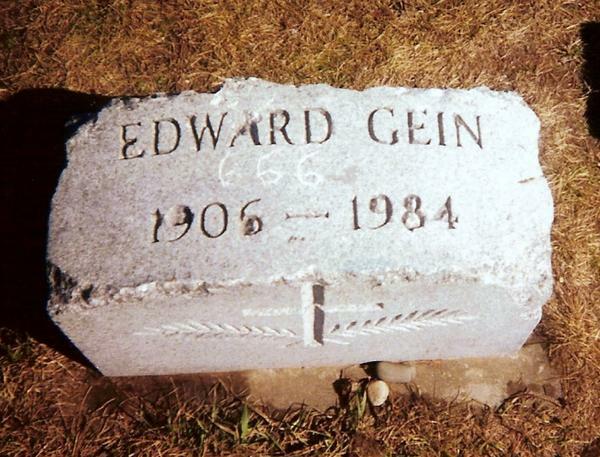 Ed Gein’s vandalized grave marker as it appeared in 1999 before thieves stole it. Gein’s crimes shocked and fascinated America at the same time. His horrific actions were beyond belief, but they have certainly been a blessing to film-makers. The infamous grave robber and murderer inspired or at least influenced the nature of characters such as Norman Bates (Psycho), Leatherface (The Texas Chainsaw Massacre) and Buffalo Bill (The Silence of the Lambs). Gein didn’t have a chainsaw and both his victims, Mary Hogan and Bernice Worden, were shot with a pistol. However, he was the real-life Leatherface and a key inspiration for Tobe Hooper’s The Texas Chain Saw Massacre. Screenwriters Kim Henkel and Tobe Hooper incorporated elements of Gein’s story and personality into the script. Leatherface wears a human’s face as a mask just like Ed Gein. No introduction is needed for Alfred Hitchcock’s masterpiece Psycho, based on a 1959 novel by Robert Bloch. When Hitchcock read a review of Bloch’s book he was hooked and immediately acquired the rights to Psycho. The iconic horror movie that was released nearly 60 years ago still scares the pants off audiences worldwide. It is hard to imagine that such a person like Norman Bates actually existed in real life, but apparently, it did and served as an inspiration for this fictional character. Both Normal Bates, the film’s murderer, and Ed Gein suffered abuse as children and started killing after their mothers died. Anthony Perkins with Charmian Carr in “Evening Primrose”, 1966. He portrayed Norman Bates. Both of them liked to dress in women’s clothes and they sealed off a room in their homes as a shrine to their mothers. 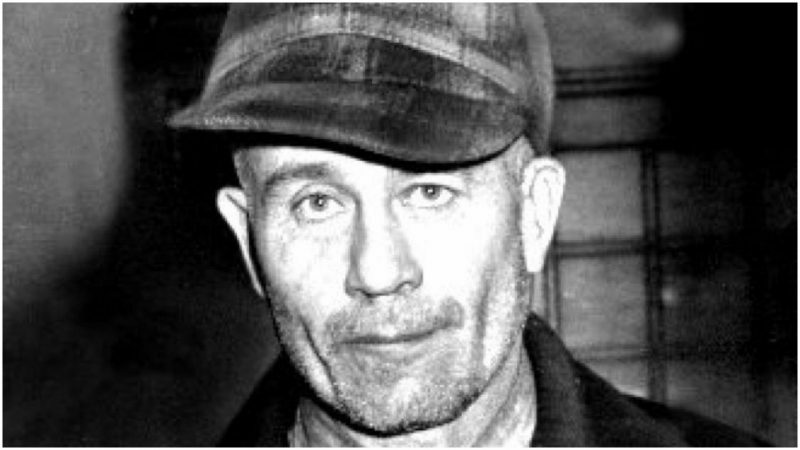 However, while Norman Bates is clearly a psychotic character, Ed Gein is a real life psychopath. Gein is not considered a serial killer because he only committed two murders, but his reputation is so infamous that he is seen as one.